See below how some of the pilots at Burning Man have protected their planes in the past. Blue painters tape is a favorite. Be careful regarding the type of tape you use because the 100+ temps can melt it onto the plane and you will take your paint off along with the tape. The Burning Man website has some tips and I'll turn this into a blog page so that others can add their suggestions. I'll add other tips soon. In a nutshell, playa dust is hard on everything. Your clothes, your lungs, your plane, your gear...virtually everything that it touches. Above is a very mild little dust storm. I've seen them 1000 feet high by 1/2 mile wide...and they approach like a giant white wall making everything in their path completely disappear from site until they've passed. 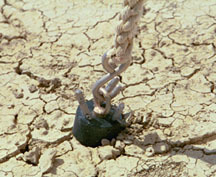 When you decide to attend Burning Man, you are accepting the inherent risks...or don't go, it's that simple. Playa dust sneaks into every nook, cranny and orifice it can find usually in the form of a white-out dust storm which can be associated with high winds forcing it deep into whatever space it's chosen to inhabit. If you are landing and staying parked until you leave, you can easily protect the plane as is shown in some of these gallery photos. Some are more extreme than others, so you will see the gamut here in levels of protection. Note the use of blue painters tape. I have never had it hurt my paint, but it sometimes doesn't stick well if you haven't cleaned the surface prior to the application. S0 be careful regarding the "type" of tape you use and if someone has the ultimate tape suggestion, email me and I'll add it to this post. You can EXPECT multiple white-outs which are filled with playa dust and sometimes last for hours. 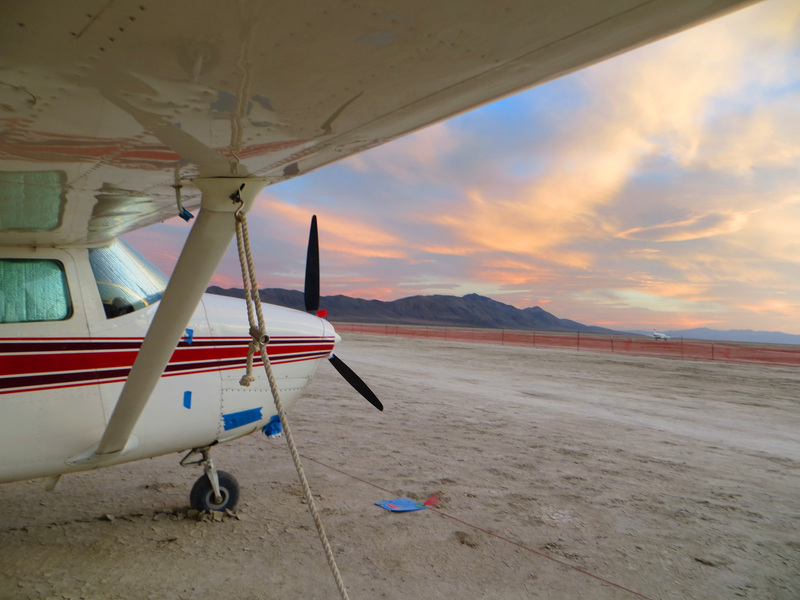 There are many things you should do to your aircraft AFTER burning man to remove as much of the playa dust as possible and the longer you wait, the more potential for damage. So maybe...one of our experienced A & P burners will make a list of suggestions for "How to Protect AND De-Playa Your Plane Post Burning Man". 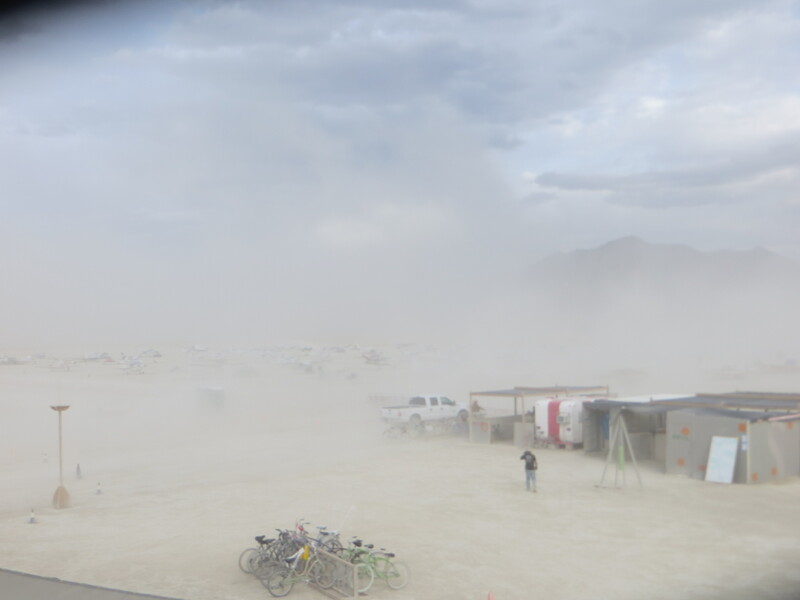 Here is a simple example of the unexpected effects of playa dust. I was flying back from an Idaho back-country trip. I ran into light rain showers...as in very light, but enough to bring moisture inside my spinner. All of a sudden, my plane started vibrating as though the engine was about to blow up! I had no idea what was causing it. All gauges read perfect. Since I was right above an airport, I did a couple of experiments to determine the cause, but ended up landing to check it out. The shop on the field wanted to remove my prop and balance it and I knew that was not the issue since it had recently been balanced. They came up with lots of ways to spend my money replacing this and that and I kept saying NO...that is not it. Keep looking! Finally, the head guy removed the spinner, looked inside, and found years of "thin" layers of playa dust that had build up until it was thick enough to turn into mud when wet and the weight of the imbalance threw my prop off enough to make the whole airplane shake. There were literally little chunks of dried mud randomly stuck inside of it. He showed me, scrubbed it clean, I test flew it...and all was well. WHO would have guessed that this would happen? So check out the gallery AND this section is open for comments and suggestions. Unlike some threads I've seen on the aviation chat room, it's not to sling mud at others comments. If you disagree, please do so with respect to the other person's opinion or I will remove your rude comment...it's that simple.